Pattaya’s oldest bar, that’s a bit of a vague term, are we talking about the first bar in Pattaya ?. Or are we talking about the longest running bar in Pattaya ?. I guess we’ll have to talk about the oldest running, and the first established bars in Pattaya, maybe. Pattaya’s modern history owes a lot to its bar scene, which began during and shortly after the Vietnam war. It was during this period that both the first, and the longest running bars in Pattaya were established. The Tahitian Queen on Pattaya beach Road opened in 1978, claims to be, and most likely is the oldest bar “proper” still currently operating in Pattaya. The Tahitian Queen on Pattaya Beach Road. 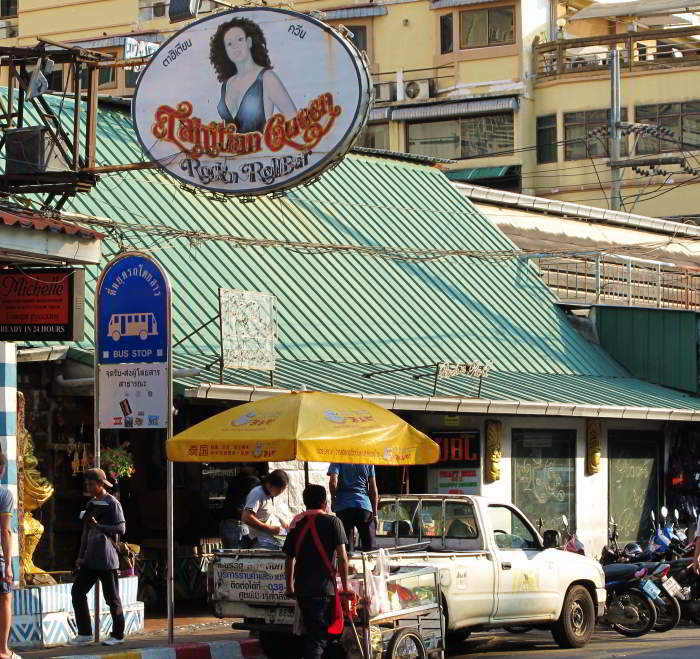 The Tahitian Queen proudly claims to be the oldest bar in Pattaya. BJ’s bar is commonly believed to be the first bar “proper” opened in Pattaya. BJ’s was established in 1974 and was located on Soi B.J, Walking Street, where it remained for over 25 years. Founded by a Vietnam veteran it was a popular hangout for Vietnam Vets and U.S special forces. Then there is Nipa Lodge Hotel, which has a long and quite well documented history. Apparently first owned by a Russian Admiral. Established in 1964 it owes a lot to the efforts of it’s first manager, a German man named Mr. Kurt Wachtweitl, who incidentally is now the Manager of the ‘Oriental’ in Bangkok. The Nipa Lodge changed ownership in 1993 and with it went the new name of Nova Lodge, which was later re-named Centra Beach Hotel, and more recently re-named Basaya Beach Hotel & Resort. Although a Hotel, (we were talking about bars after all), the then Nipa Lodge laid claim to being Pattaya’s first Hotel, first Bar and first Discotheque. Of course, the title of “Oldest Bar in Pattaya” may be self claimed. I am sure there are many more bars out there who perhaps privately would claim to be the oldest bar in Pattaya. I seem to remember once having a drink in the Rose Marie Bar on Pratumnak Road a few years ago and the old Lady, I think she was Owner / Mamasan, claimed it to be one of, if not the oldest bar in Town.